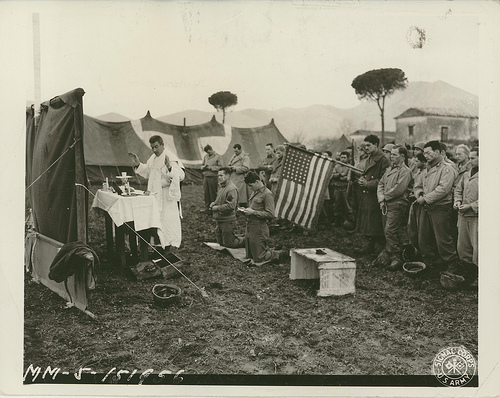 “Christmas Day services near the front, in Italy. 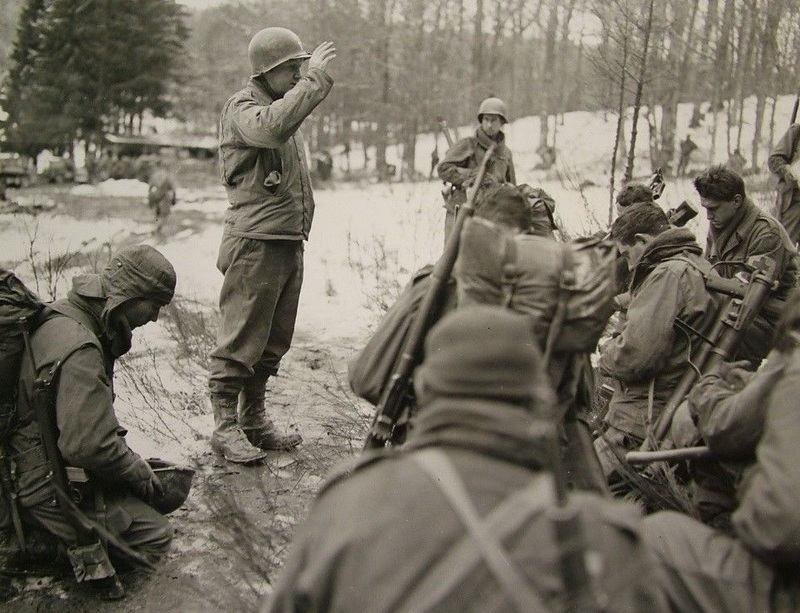 Lt. Col. William E. King, of Kansas City, Mo., Chaplain of the 45th Division, speaks to men assembled near their Bivouac Area. Notice the Young dog by the Altar.” Venafro area, Italy. 25 December 1943. 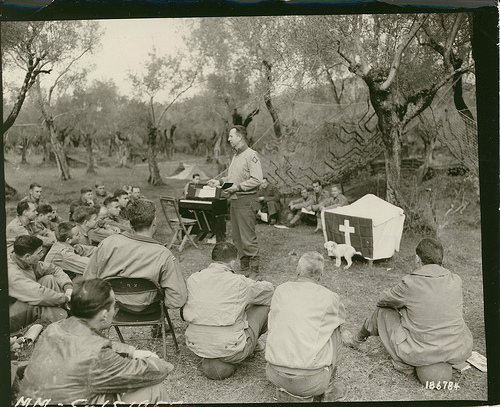 Chaplain Lt. Col. William King leads troops of the 45th ID in Christmas Day services in Italy, 25 December 1943. “1st LT Harvey Floyd Bell, Chaplain of 1st Bn., 180th Inf. 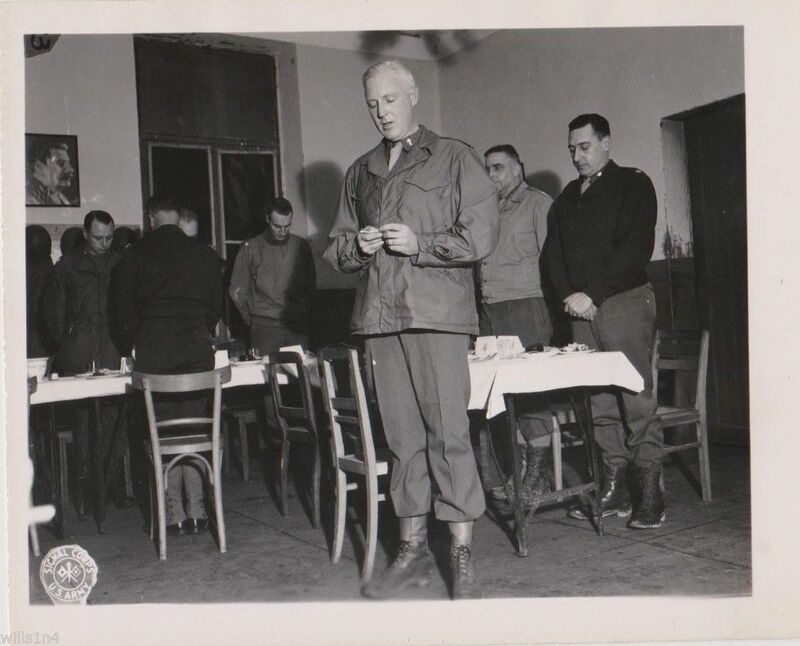 Regt., says grace before Christmas dinner is served.” Demanio area, Italy. 25 December 1943. 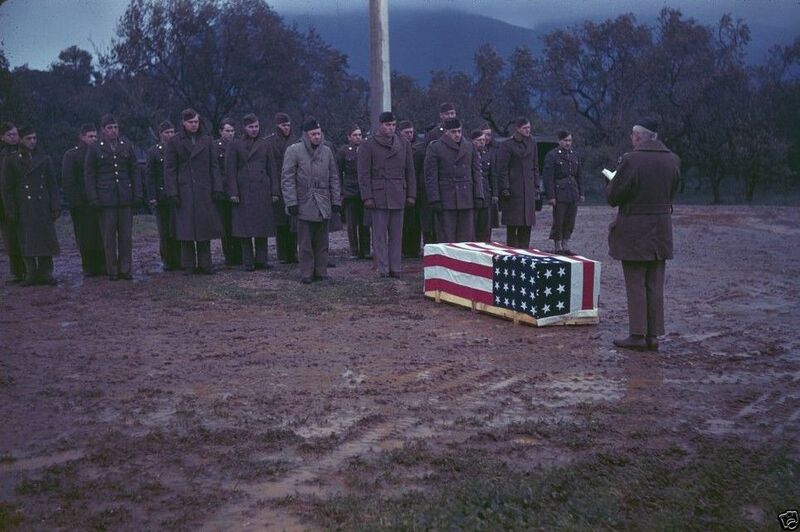 “During prayer, the flag is lowered at outdoor Christmas Day services conducted by LT Aloysis S. Carney, Jersey City, New Jersey, at Headquarters of 120th Medical Clearing Co.” Venafro area, Italy. 25 December 1943. Chaplain (Major) Edward J. 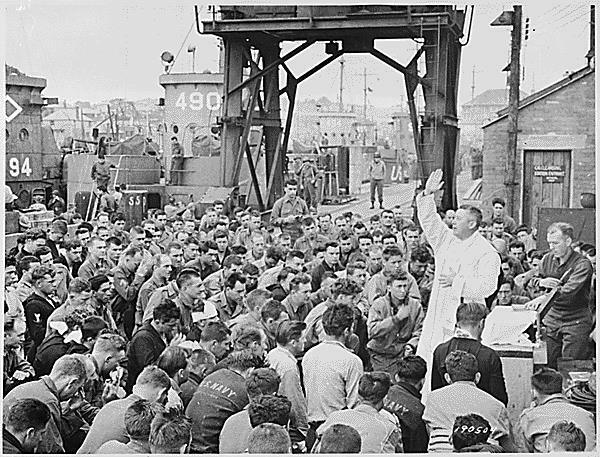 Waters, Catholic Chaplain from Oswego, New York, conducts Divine Services on a pier for members of the first assault troops thrown against Hitler’s forces on the continent. Weymouth, England., 06/06/1944 (U.S. National Archives). 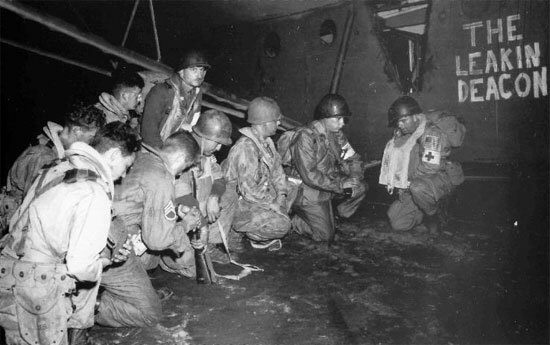 “The Seabees of the 111th Naval Construction Battalion give thanks on D-Day plus 12, 18 June 1944. 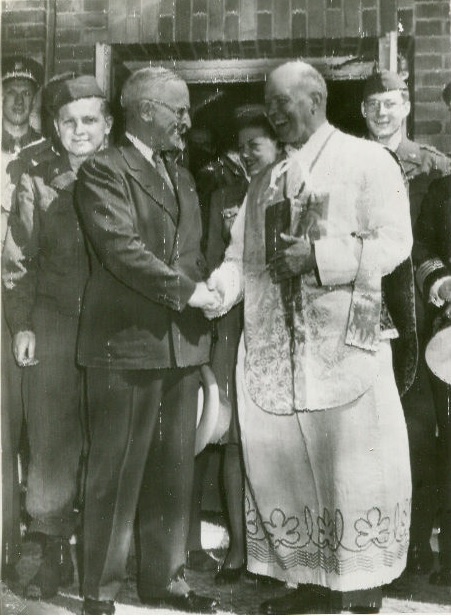 Navy Chaplains have served around the world with Seabee battalions since their inception in 1942. 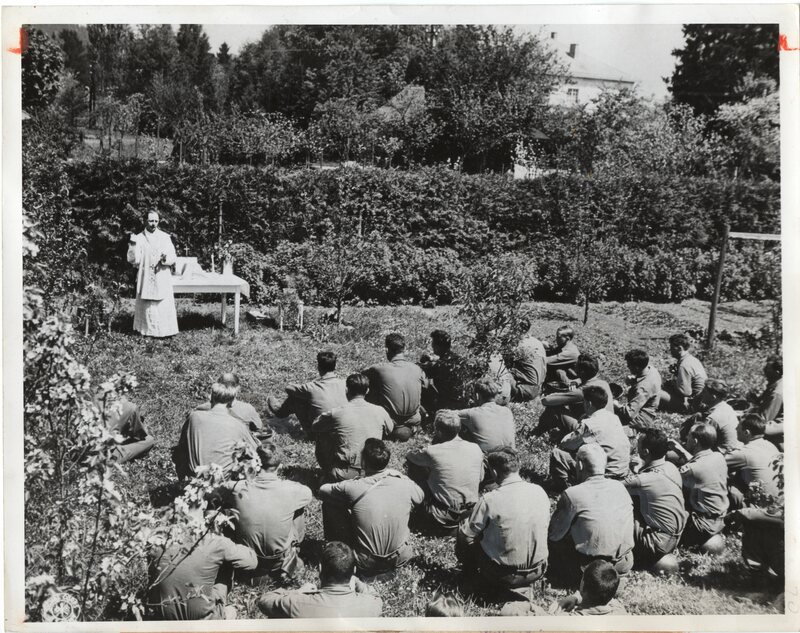 Chaplains prayed and conducted regular services, using any available area including a ships deck, an apple orchard, a hand-cut hole in a Pacific-island jungle or a makeshift tent for a church. 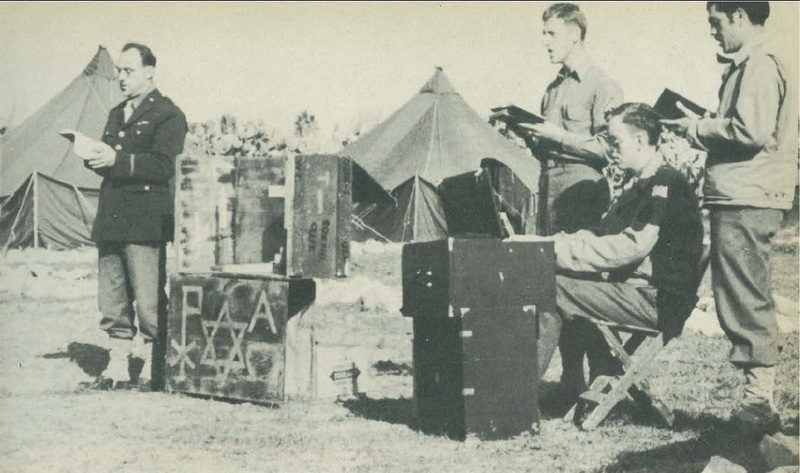 They will use a jeep, packing case or ammunition box for an altar, or a helmet for a yarmulke, the top of a mess kit for a paten or a canteen cup for a chalice” (from http://www.history.navy.mil/seabeemuseum). 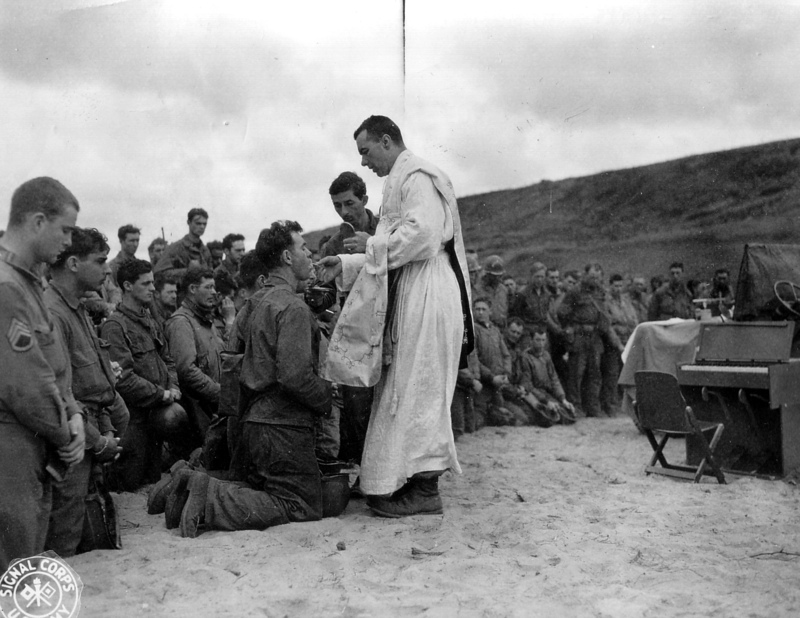 Chaplain John McGovern of Boston, Massachusetts gives communion to a US soldier on the beach of Vierville-sur-Mer. 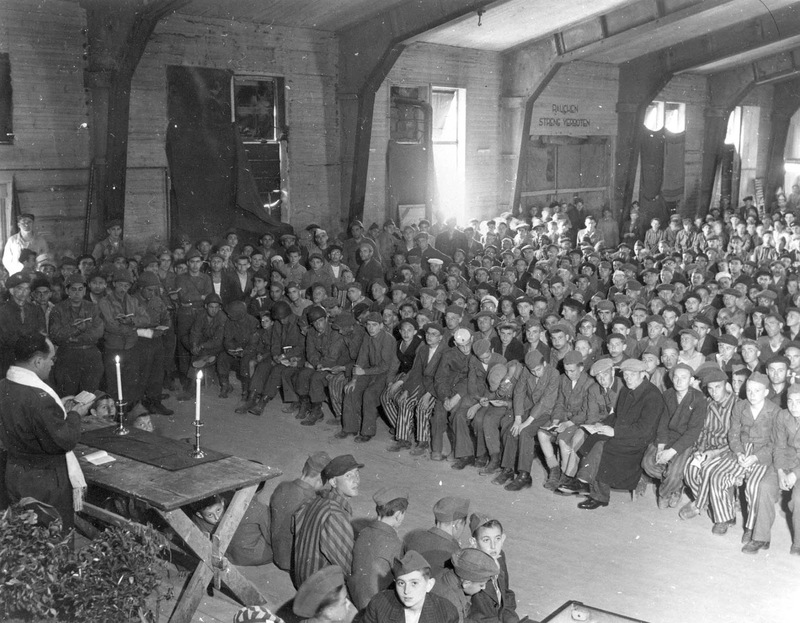 Mass on the location of the first temporary cemetery. 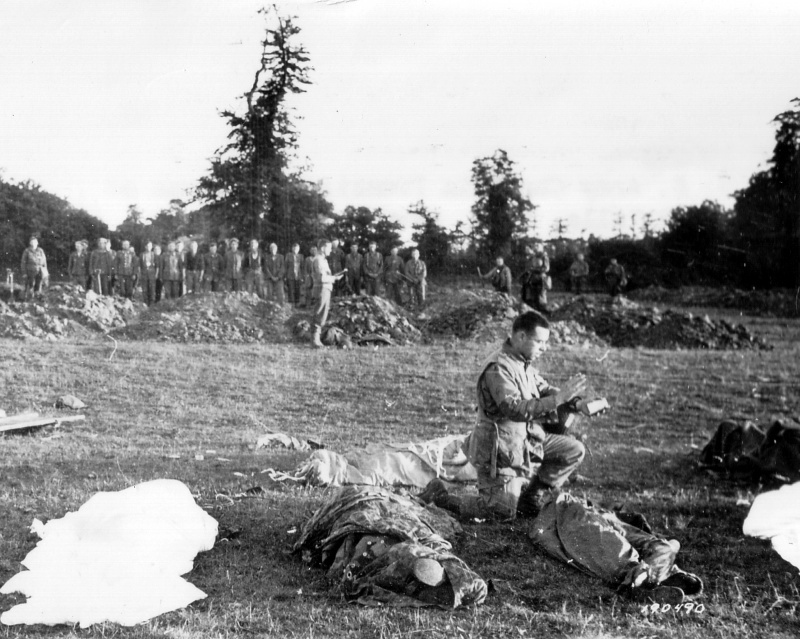 From June 7, a section of the QM 606th Graves Registration Unit started collecting the bodies of dead soldiers. 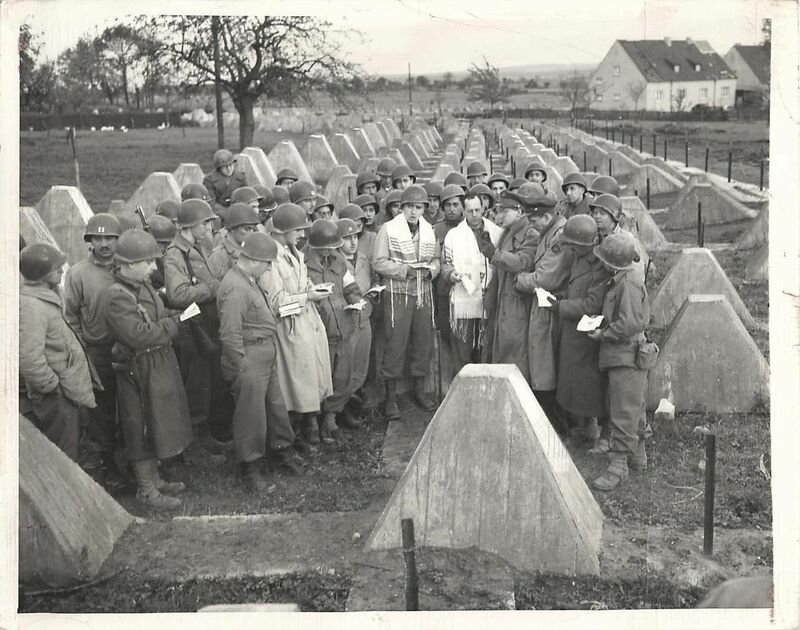 A first temporary cemetery was located at the foot of the cliff Vierville- sur-Mer for all Omaha Beach. He was near the villa Philippe Marchal. A monument perpetuates the memory. “Memorial Service on Beach-Head for Those Who Fell in the Assault. 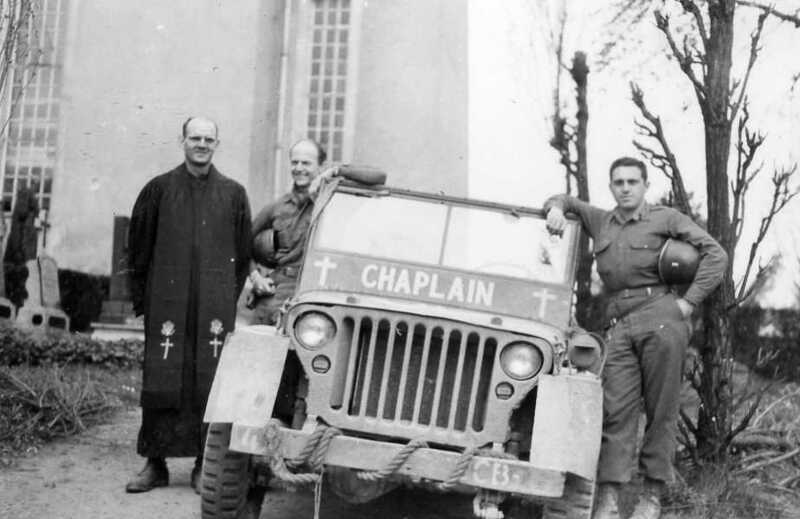 With the bonnet of a Jeep as an Altar a U.S. Army Chaplain conducted a Memorial Service for those who fell at the first U.S. cemetery to be laid out on a French beach-head. 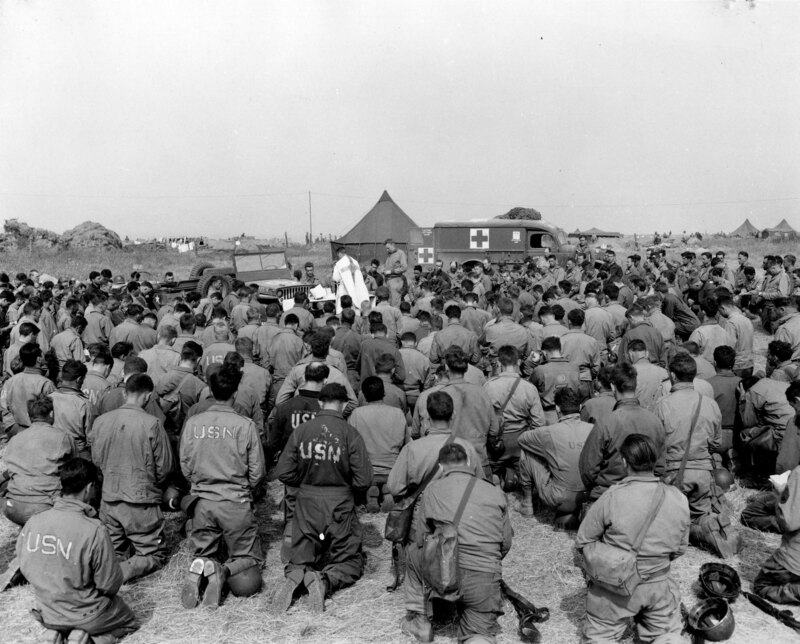 Troops kneel in prayer as the Chaplain celebrates Communion…14/6/44” (author’s collection). 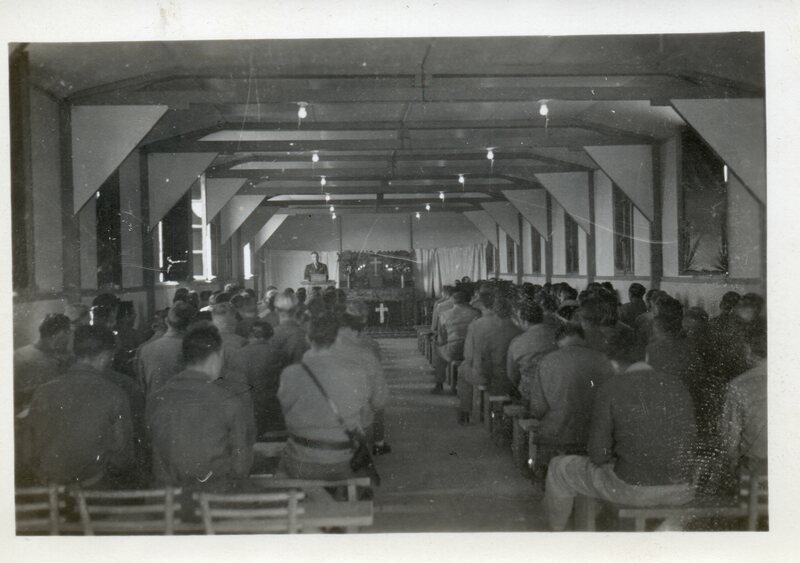 “Services are held in the 1st permanent U.S. Army chapel in France in World War II. 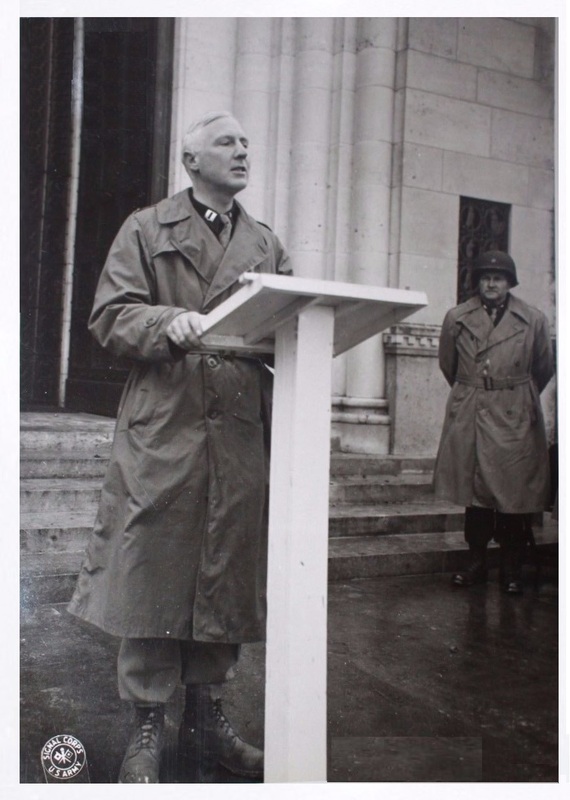 Chaplain Theodore P. Bornhoeft, Cedar Rapids, Iowa, in France since D-Day plus 2, established this chapel five days after his arrival. Vierville Sur Mer, France. 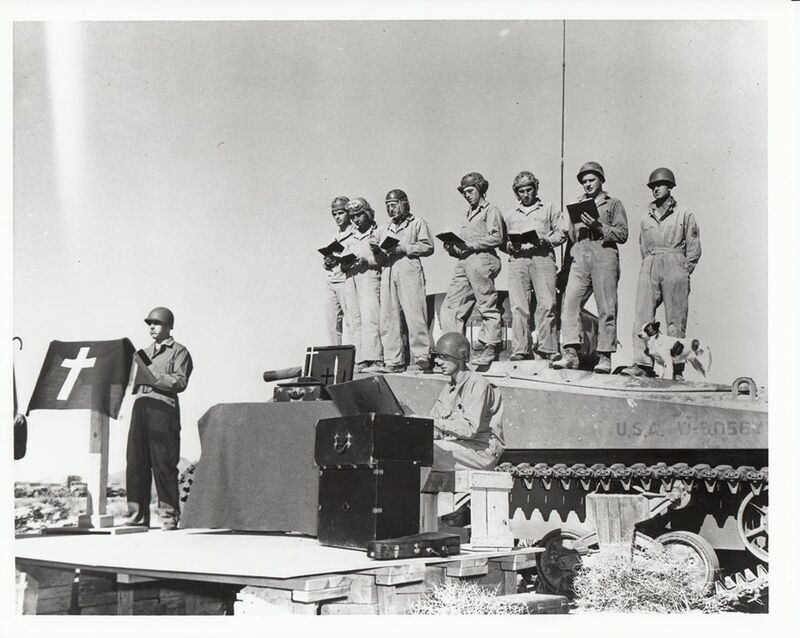 11 July 44, Signal Corps Photo” (Author’s collection). FRANCE. June/July, 1944. 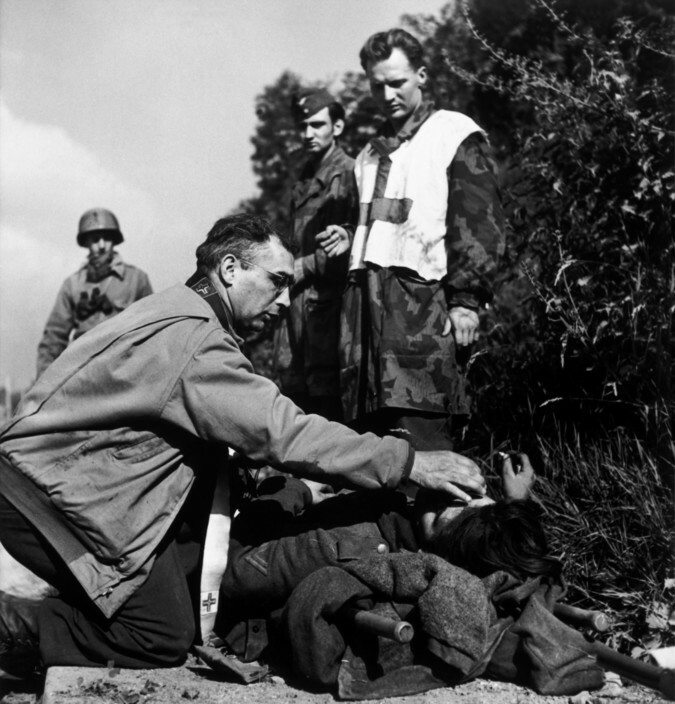 An American chaplain comforts a dying German soldier as prisoners of war look on. 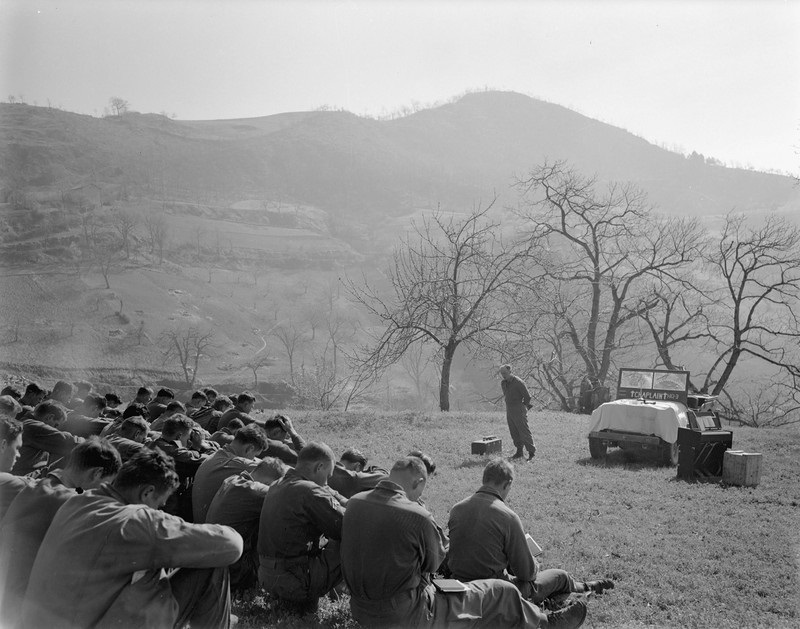 Chaplain F. McDonald of the 12th Army Special Troops, leads a Thanksgiving prayer for the leaders of the 12th Army in 1944. 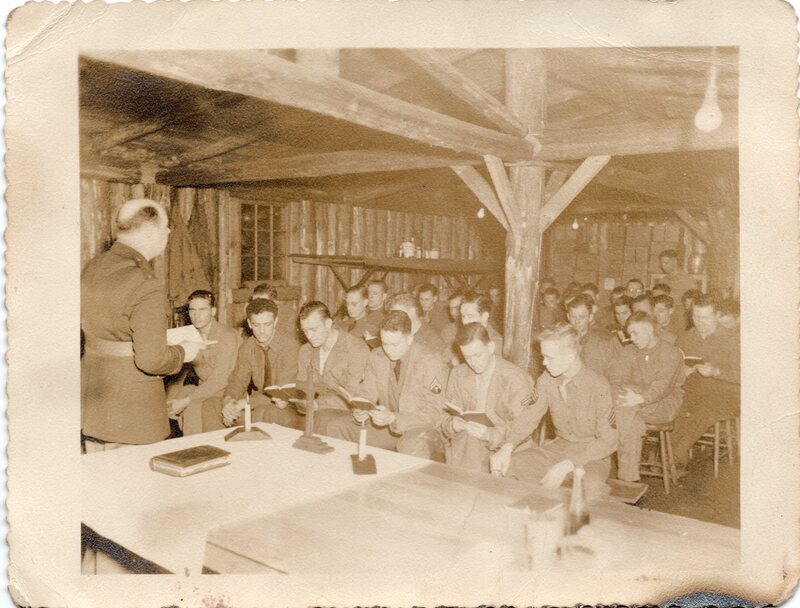 Chaplain Karl Scheufler leading a worship service in WW2. 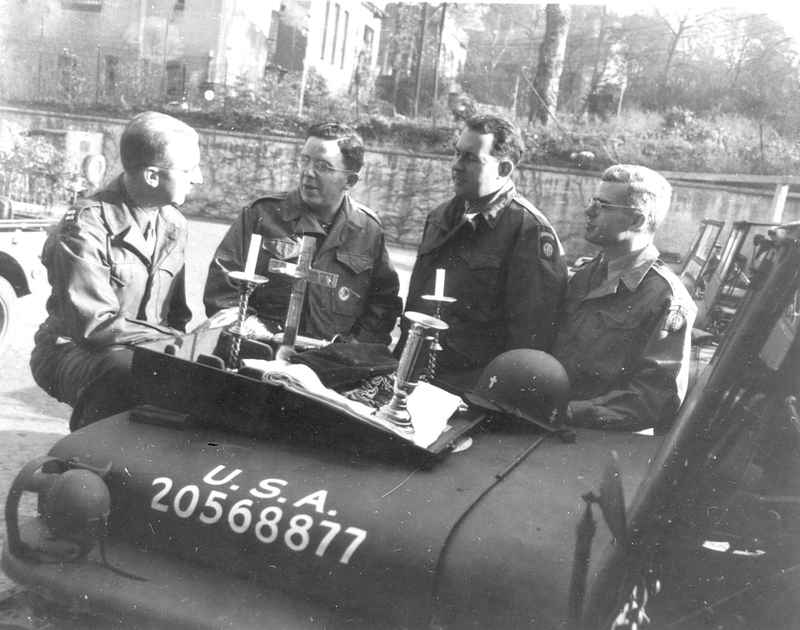 Chaplain R.T. DuBrau in in France, 1945 (Library of Congress). 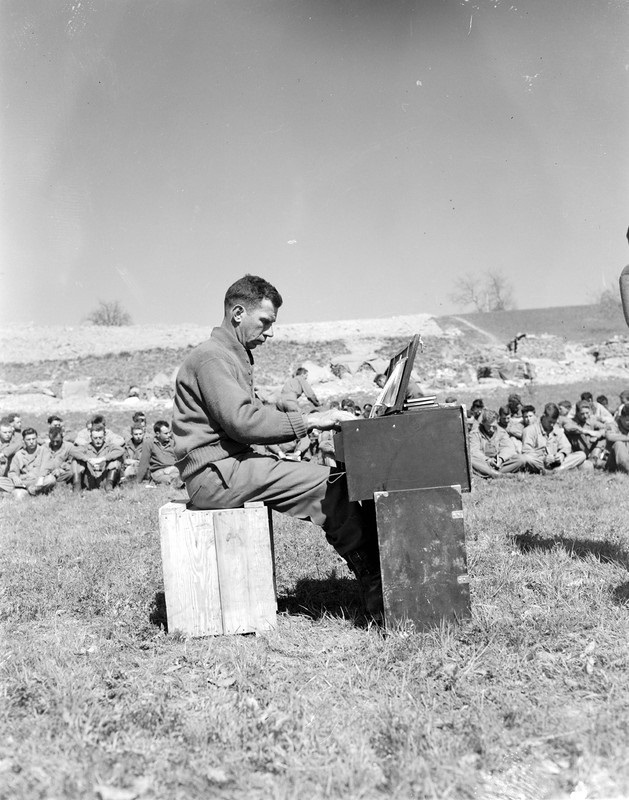 Chaplain (CPT) Guy C. Jones conducting worship service for Co C, 1st BN, 135th IN Reg, 34th IN Div 25 Jan 1945 in Tazzola, Italy. 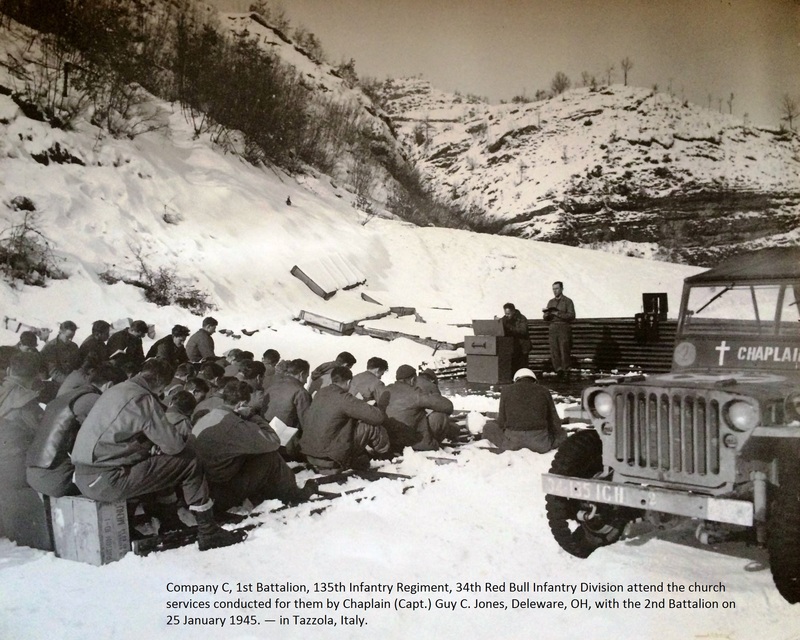 “Soldiers kneel in snow as Chaplain F. T. Bolye, formerly with St. Andrew’s Parish, Chicago, Ill., says prayer for Infantrymen of Company E, 2nd Battalion, 424th Regiment, 106th Division, before they go into battle. 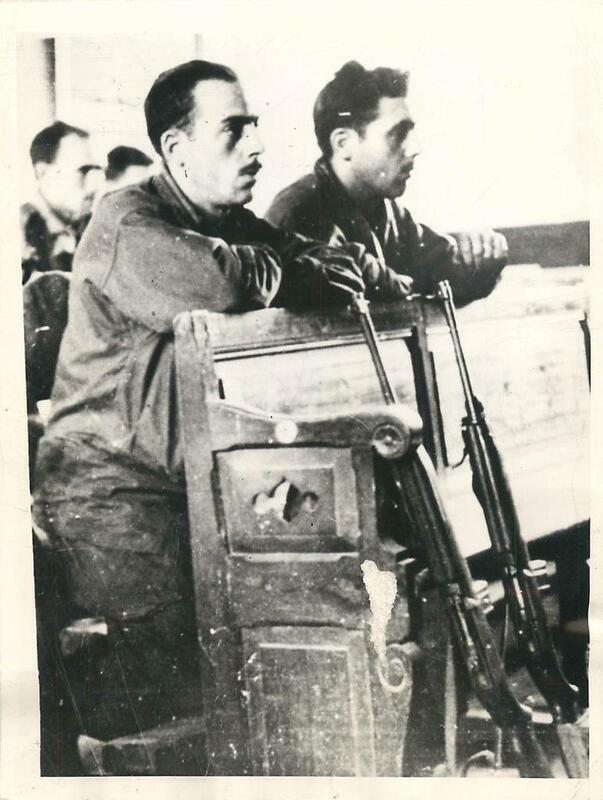 5 March 1945.” Signal Corps Photo, released by Field Press Censor 8 March 1945. “CHAPLAIN CORPS WILL HAVE 170TH ANNIVERSARY. 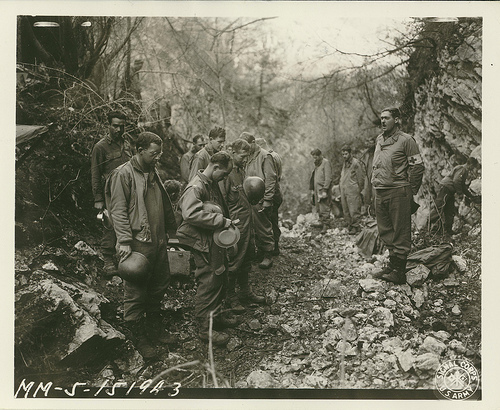 Austria — While men of the 80th ‘Blue Ridge’ Infantry Division sit on their helmets, Catholic Chaplain Edward J. Comer, Grand Rapids, Mich., conducts a field Mass somewhere in the Austrian Alps. 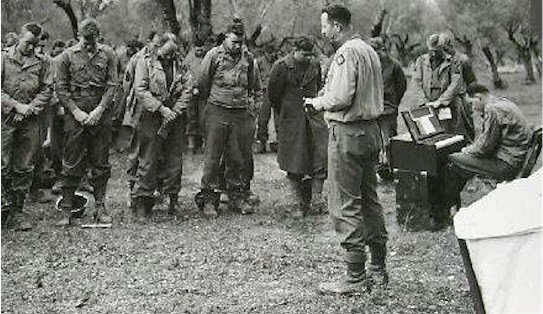 On July 29th, scenes like this will be enacted all over the world, and other celebrations will be held to observe the 170th anniversary of the Army Chaplain Corps, which at present has 8,000 members. 7/22/45 (author’s collection). “Worshipers in Khaki. 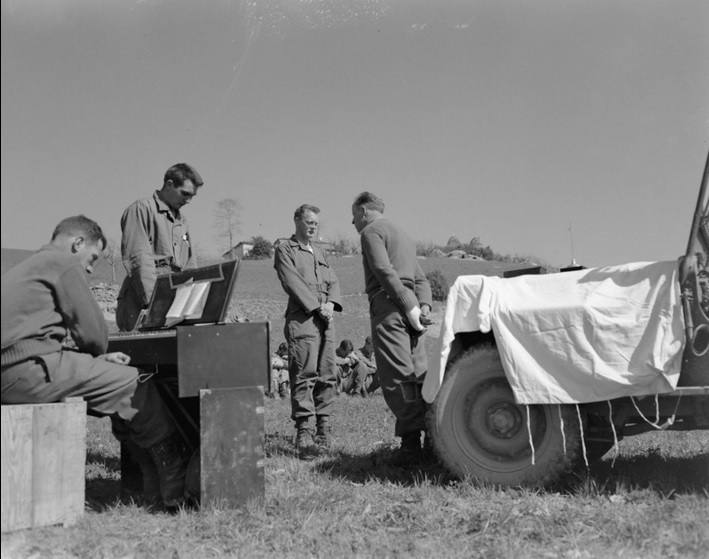 Brest, France–Using a straw-covered Jeep as an altar, Chaplain John Reaves, Mayfield, KY., says Sunday Mass in a grove just outside Brest. 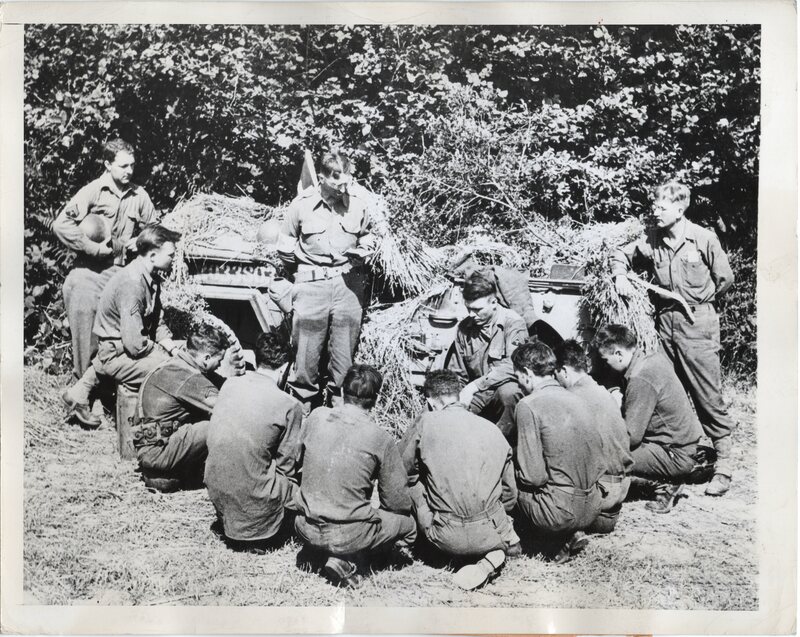 Doughboys, kneeling around him in a semi-circle, follow the services, 8/21/44” (author’s collection). 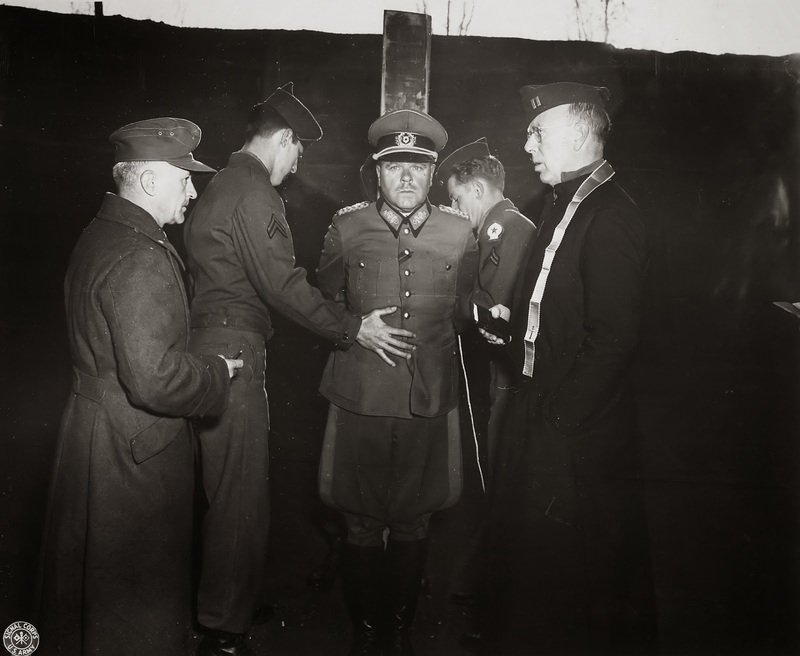 Unnamed Army chaplain with German General Anton Dostler, tied to a stake before his execution by a firing squad, Italy, 1945. 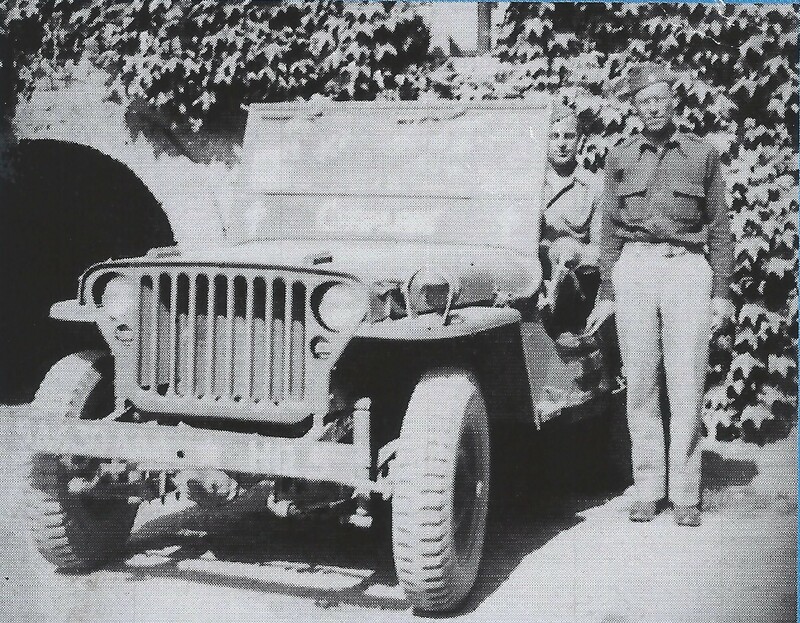 This jeep was decorated by LDS chaplains in World War II. On the windshield are images of Angel Moroni, a beehive, and the word Deseret. 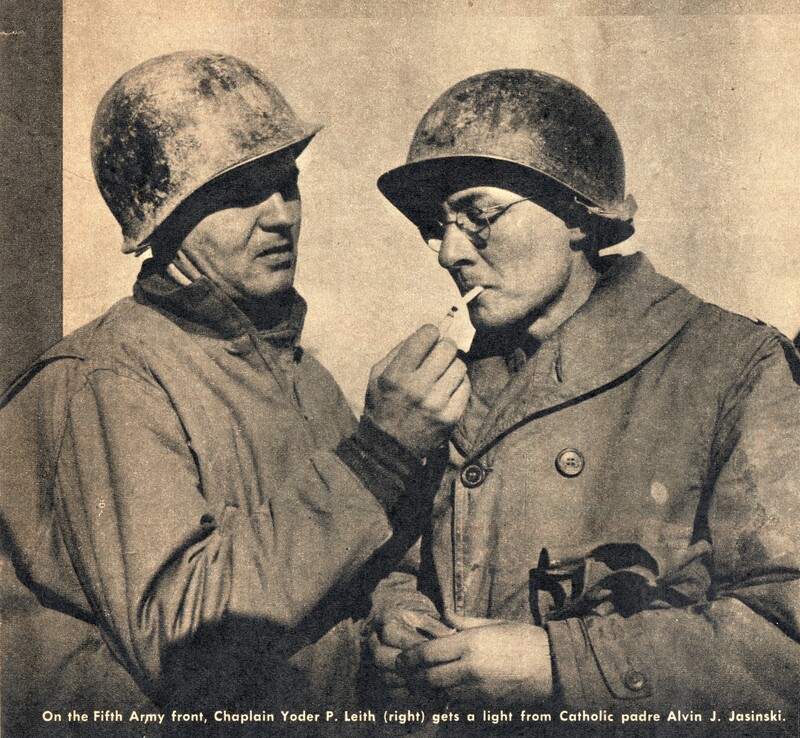 “On the Fifth Army front, Chaplain Yoder P. Leith (right) gets a light from Catholic padre Alvin J. Jasinski” from Yank magazine, 13 April 1945 (author’s collection). 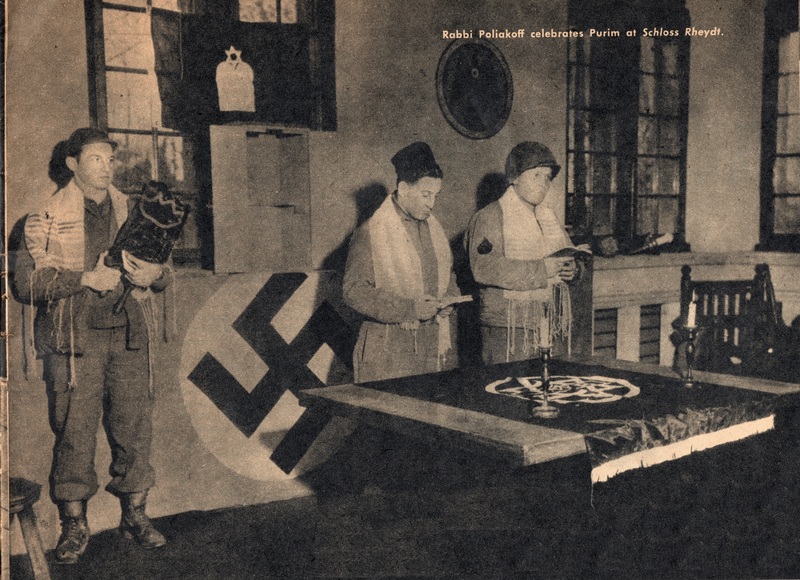 “Rabbi Poliakoff celebrates Purim at Scholoss Rheydt in Paul Joseph Goebbels’ home town” from Yank magazine, 13 April 1945 (author’s collection). 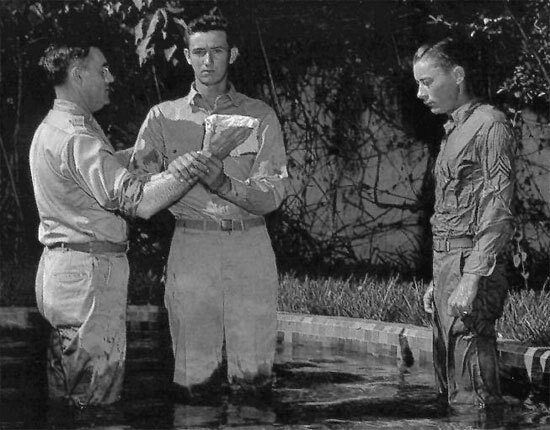 Chaplain Frank Arnold baptizing a Soldier. Chaplain hearing Confession and giving Absolution. The chaplain, with captain rank wears the narrow ribbon stole. 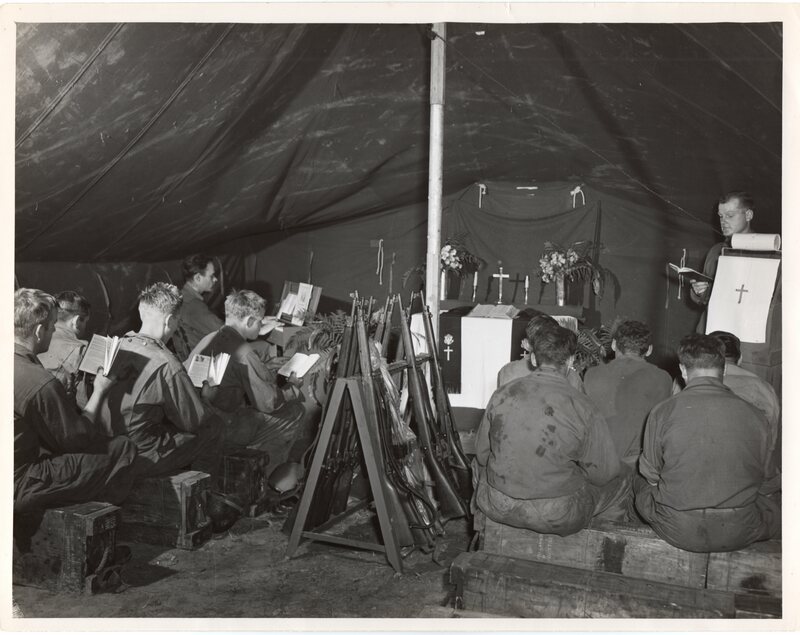 Unidentified chaplain leading worship in a makeshift chapel (author’s collection). 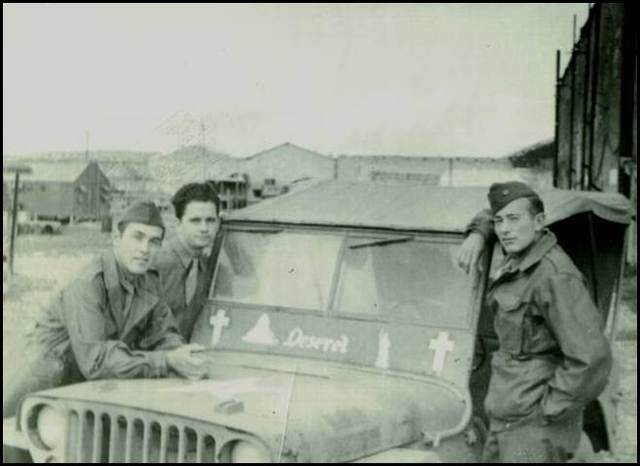 Chaplain Earl Hunter somewhere in Italy late in the war in Europe, before being reassigned to a Combat Engineer unit being trained up to deploy to the PTO (from “Designed for Rigor” by Earl D. Hunter, author’s collection).